It's become a bit of a tradition to review the passing year in terms of work & designs, and as I look back it becomes apparent that 2010 has been a somewhat productive year! Which surprises me, as it really didn't feel like it. And here we have the single patterns and those published in books or magazines - and there's a lot more of these than I thought, 24 in fact! 2009 saw only 14 published designs, though that was the year when loads of back end stuff was done. 2008 saw 24 published designs yet 2007 was another super productive year, with 35 designs published and 2006 saw 30. So really, 34 is not really that bonkers. And let's not forget that many of the designs may have been knitted & written last year, especially those from TWT. Still, the number does surprise me. It felt like it was a busy year but for lots of other reasons. You probably know by now that I'm not one of those that writes themselves a business plan or sets any sorts of targets. I don't want to be that organised, as I find it stifles my creativity, and I generally go with the flow. Having said that, for the coming year I've set myself a couple of goals and they're already scaring the heebies out of me. The first big plan is to get the 3rd edition of Going Straight done. There will be very little changed in terms of the layout; the big focus here is the charts. The need for the 2nd edition came with the cost of printing, especially printing colour, and GS was originally a full colour book. Unfortunately at the time my charting skills weren't fantastic and I relied heavily on a software that I wasn't totally in love with. It did the job but I guess I always knew I'd never be totally happy with it until I tackled my charting skills. And now that I've done that, it's time to get this book up to scratch. And it's an important job, as ArbourHouse are waiting for me to get it done before they do any more print runs! Once that's done (and it will be done soon) I can indulge myself completely in the next book, all about Hats for kids! I'm itching to get started on this one and have some real good fun with the designing and photography. A few of the designs are already finished (erm, about 3 or 4?) but I am trying to discipline myself and get the other admin tasks done first. But here's the thing - I have absolutely no idea of a title for the book! WWT and TWT have a theme in the title. which works for them, but it won't work for every book going forward (assuming there'll be more than 4...?) and now's a good a time as any to break that format. But I'm completely and utterly stumped and am open to suggestions, so please do leave a comment. 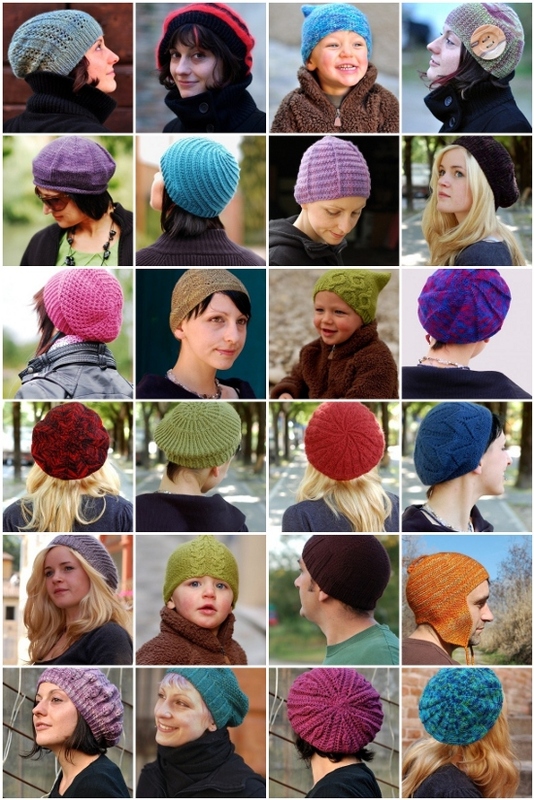 Otherwise, I'm hoping that some Spiral Hats will feature in 2011. I miss their fluidity and randomness and hope the business will let me have some time off to play. It's been too long. Hey, did I tell you that I now have a Canadian distributor for my print patterns? This is great news, as I do get folks asking if shops stock my patterns there. I've also got the newsletter sorted out and moved to a new host, so I aim to be a good business girl and actually send some out occasionally. Castiel will be the January KAL pattern in the Ravelry group, and we'd love for more folks to join in. And finally - there's an interview with me and a giveaway (where you could grab some WW patterns and ebooks) over on Yarn On The House. The giveaway is open until 2nd Jan, so do hop over and leave a comment.